Weather ruins my Easter weekend! As well as being a technophile my other main hobby is competing at dog agility. I share my life with my wife and my five terrier crosses, Toby (17 years old), Fred (14 years old), Charlie (10 years old), Boris (4 years old) and Basil (2 years old). They have all competed at agility a sport they love. You can see some of my efforts on my youtube.com page. Agility has become a major part of my life, initially it was a diversion from my mundane job but I have steadily become more involved. I joined and then become the chairman of Nottingham Agility Dog Training Club. I have also become an accredited judge after taking the Kennel Club Regulations and Judging Procedure examination. This weekend should have seen me at the Dashin’ Dogs Easter Show, four days in the heart of Cheshire on a lovely hilltop venue with views over Chester and in the distance the Queensferry and Mersey Estuaries. I was due to be judging today but unfortunately events overtook the show and it has been cancelled. We arrived late on Thursday afternoon and it was cold and windy, the ground was a little damp but was holding up to the traffic reasonably well. 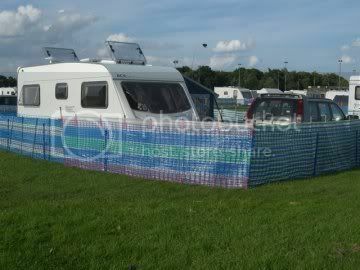 I erected the windbreaks around the caravan and decided to leaving put the awning up till Friday morning because of wind. The weather forecast for the weekend was for cold, very cold weather with the risk of rain, sleet and snow. We retired to spend the evening watching a bit of TV and went to bed. However the wind was getting much much worse, with bouts of torrential rain and occasionally hail the caravan was rocking wildly. This was a full blown storm! I was struggling to open the caravan door because of the strength of the wind and the windbreaks were leaning precariously but seemed to bearing up. Then at around 2am we were waken (we weren’t really sleeping) by beeping horns and people shouting, quickly dressing I popped outside to discover that the panic was because the organisers marquee had collapsed and another had disappeared across the field into the darkness. Around 30 people were rushing to secure the now exposed equipment and load it into vans, cars and caravans and dismantle the flapping marquees. The PA equipment van had also toppled over. As well as the marquees other peoples caravan awnings and tents were collapsing under the tempest’s onslaught. I finally went back to bed about 4am and we awoke to blazing sunshine but still howling wind! Understandably the organisers Nigel and Emma had no choice but to cancel the show, the forecast was for continuing strong winds and it would have been negligent to risk the safety of the public and dogs in those conditions, let alone the logistical nightmare of the lost marquees. The rain and sleet had also turned the field into a potential mud bath and a number of people without four-wheel drive needed towing off. So forlornly we packed up (difficult in the wind) and travelled home (taking it slow in the strong wind). The caravan is now sat on the drive and needs a bit of a clean inside and out. It will be off back to storage later today and then we have to decide what to do over the next couple of days! Given the bad weather it probably won’t be a lot!